Dumneazu: Shrimp in Budapest? Shrimp? Amid the international froofrah that Hungary has stepped in since taking the rotating presidency of the European Union, one burning question has been pushed aside in the tumult: what’s for dinner? Yes, at our house that is the burning daily issue, a struggle between what we can get in the market and what we actually would like to eat in a pleasant and perfect world. Winter in Hungary means… cabbage, carrots, and very expensive imported vegetables. Meat narrows to a choice between pork or chicken. And in our home, we simply get tired of the traditional Hungarian round of stews, soups and veggies-in-sour-cream that make up the winter Magyar diet. And the worst time is around Christmas, when Hungarians go beserk with overproducing the really good stuff, and everybody ends up sending beiglis to each other and sharing wheelbarrows of leftovers, like our friend Judit’s stuffed cabbage cooked by her Mom. The sad fact is that during the winter I tend to put on weight, happy to chow down on a default diet heavy on pasta carbonara and chicken paprikas ladled over mamaliga until, sometime around May, green veggies return to the market. This year I said a firm No! I have basically cut out 95% of all those tasty carbohydrates and have halved the portions I eat. And this gives Fumie an advantage to our daily dinner debate: Hungarian, Italian, or Asian? With Italian food knocked out of the picture, and Hungarian cuisine hobbled by a wintertime starch glut, we eat a lot of Chinese and Japanese food. I haven't eaten breakfast yet, and this post has made me ravenously hungry. 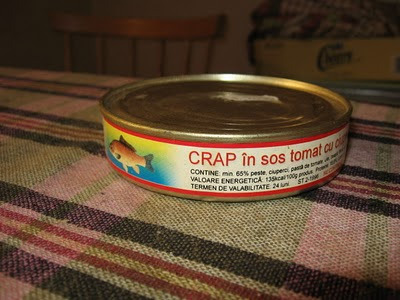 Not for carp, though. long time lurker here...does Fumie go for natto? Do you? That is my favorite Japanese food, bar none. All big natto fans here. We have even tried making it at home - stank up the house very bad. About ten years ago there was the "Natto Man" in Budapest - a Japnese guy who made and delivered natto to the Japanese community here, but he dissappeared. Now we can buy it in Vienna and bring it home and refrigerate it. Hungarian Bagpipes and Media Dignity.